The Bar Association of Metropolitan St. Louis (BAMSL) is a Missouri not-for-profit corporation dedicated to building better lawyers. Each year our sustaining members, sustaining partners, 100% club firms, and event sponsors generously support BAMSL. To learn more about the different ways to support BAMSL, check out the information below. 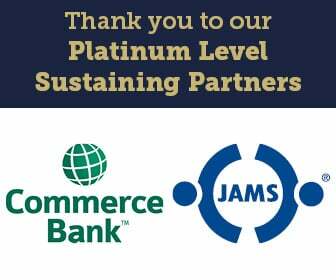 Our Sustaining Partner program is a way for firms, organizations and companies who would normally support BAMSL throughout the year with many of its events and activities to do so on a larger and more visible scale. Sustaining Partners, which are renewable each bar year, support a wide range of annual events for BAMSL members and receive regular, ongoing recognition for their investment in the association and support of our programs. Because of our generous Sustaining Partners, many programs can continue and even be enhanced. Invitations to exclusive events, including a pre-party reception at BAMSL's annual Member Holiday Party and an opening reception at the Bench & Bar Conference. Two free ethics CLE hours. Free admission to select signature events. Recognition at BAMSL events, on the website and in BAMSL publications. BAMSL's 100% Club consists of firms where 100% of their attorneys are BAMSL members. To be eligible for the 100% Club, a firm must be compromised of five or more attorneys located in the St. Louis metropolitan area who are licensed in Missouri. Extra recognition of your firm at BAMSL events, in publications and on the website. Two free Missouri MCLE ethics hours annually for each attorney. Pre-party reception at BAMSL's annual Member Holiday Party and other exclusive events. Master bill of member dues for all employee dues, instead of individual bills. Priority seating at select BAMSL events. You might be closer to 100% than you think. Give Member Relations a call at (314) 421-4134 or e-mail membership@bamsl.org. We will be happy to assess your firm's current status to elevate it to the 100% Club.